Haleem is a dish of Arabic origin, popular in many parts of India in it's different avatars. In UP it is made more like a chunky porridge and is called Khichra, everything else is blended well but the meat remains in small chunks. Pakistani, Hyderabadi and Bangladeshi Haleems are all smooth in consistency, so much so that it looks like a thick brown , almost an ugly food. Some people like me, want a little chunkiness and use coarsely ground meat. Others use finely ground (or machine ground in modern times) meat for smoother texture. Flavors remain almost the same though. You get the taste of the lentils and a mild hint of wheat into it. The fresh herbs Coriander greens and Mint add a nice finishing touch to a deeper flavor of this healthy dish. I find Haleem quite healthy as I don't believe one's body imports Cholesterol from meat or chicken, or even ghee or butter. A carb rich diet is more conducive towards catapulting one's Cholesterol sky high. But that's not the point of discussion here. 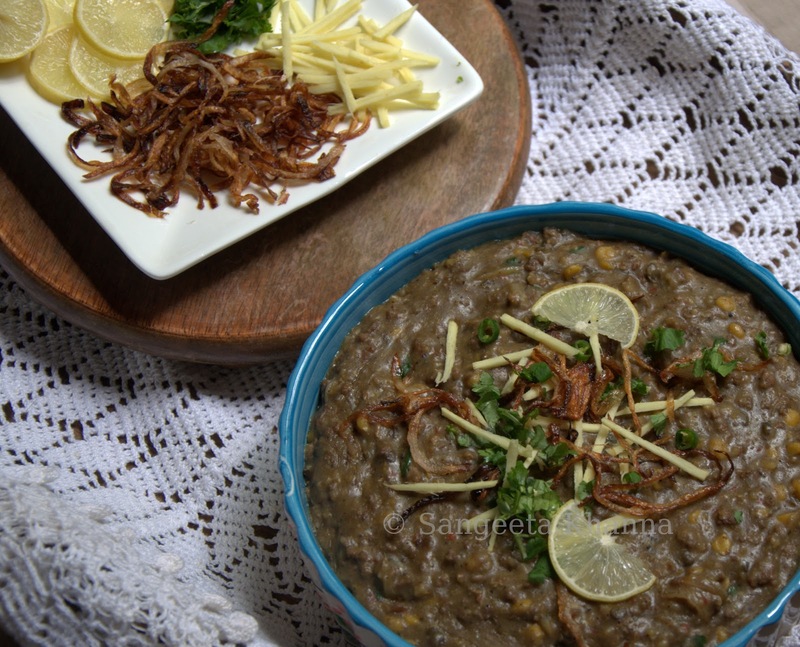 Haleem is something you cannot overeat. Everything is cooked in a manner hat it soaks up a lot of water and bulks up. Healthy by my definition. It is a complete meal in itself and probably a main course in most families where it is made and enjoyed regularly. For festive meals it is a part of a starter like they do during Ramjan, the meal starts from a few fruits, dates and then they have Haleem, progressing towards heavier stuff. 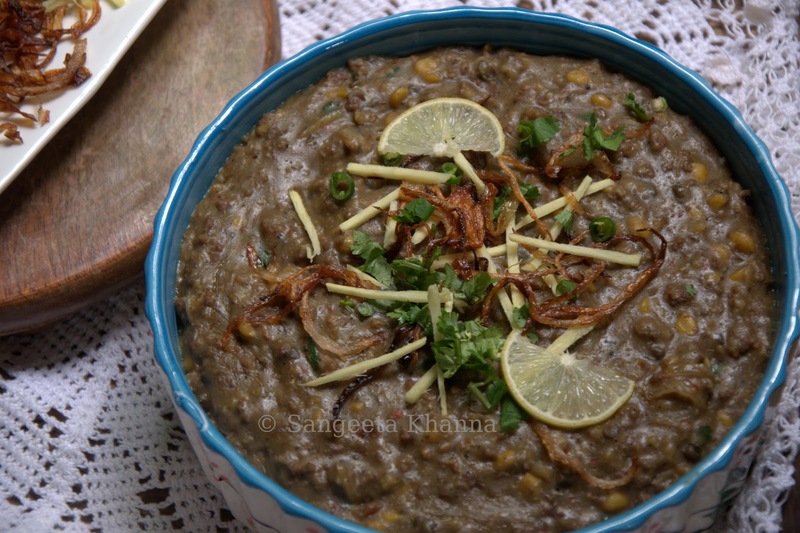 I have been making my Haleem loosely based on a Pakistani recipe I saw long back, I have adjusted the ingredients to my taste and cooking procedure to my liking, as I mentioned, a slight chunkiness of chana daal and mutton mince is relished t my place. 2. to be boiled (pressure cooked) together..
to be bhunoed into a large kadhai..
Pressure cook the ingredients mentioned under the 2nd list. Till the pressure builds up and then for 5 minutes more. 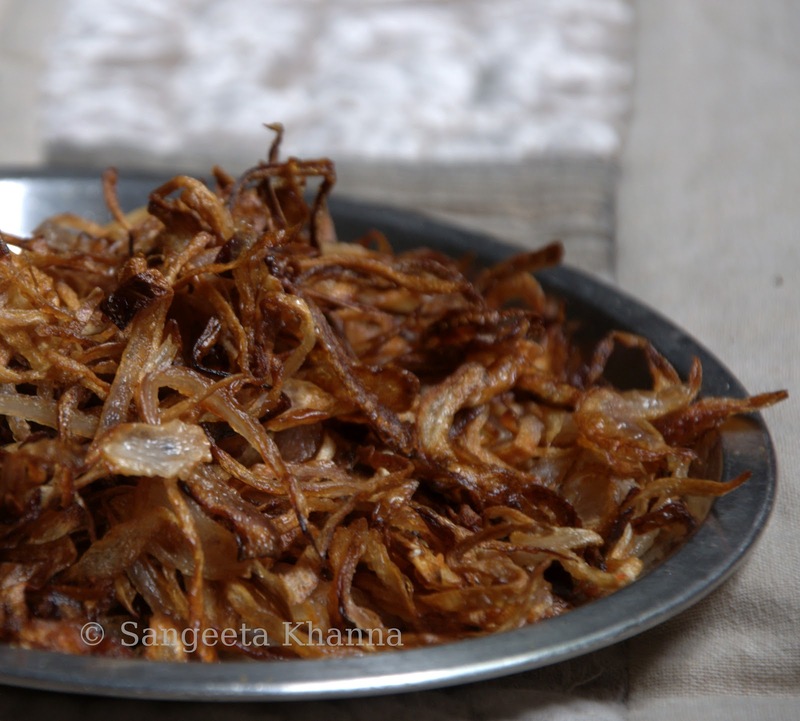 Heat the ghee in a large kadhai and fry the onion slices on medium flame till they all turn golden brown and crisp. Drain and keep aside. Now take out almost half of the ghee from the kadhai and save it for further use in some other dish. Proceed with the 3-4 tbsp ghee in the kadhai. Heat the ghee and tip in the cumin seeds. Then add the ground masala paste and bhuno till the ghee separates or the masala paste looks shiny and glazed. To reach this stage you need to stir it frequently and scrape the sides of the kadhai as the cooking mixture sticks to it. This allows a nice uniform bhunoeing. Add the mutton mince and bhuno it on low flame stirring almost all the time. Within 5 minutes the mince would turn brown and almost dry. This is the time when you add the cooked mixture from the pressure cooker into this kadhai. Mix well and cook on low flame. Keep stirring in between as it has a tendency to stick to the bottom and start burning. You might require to add some water in between to get a consistency you like. If you like your Haleem very smooth you would like to blend the cooked lentil and wheat mixture with a stick blender before adding. I like the specks of chana daal into the finished Haleem so I don't blend the mixture. Other lentils and broken wheat gets completely blended during cooking itself. Add water/mutton broth in between if required, the consistency should be almost like khichdi or risotto. Add the fried onions after about 20 minutes of cooking and keep stirring. Save a handful of fried onions for garnish. It will take about 45 minutes of boiling to reach a slurry like consistency. That is the time when it is ready to be served. Serve hot garnished with the ginger julienne, fried onions and coriander and mint greens. Some Lime slices look good and Juiced onto your serving it gives a nice freshness along with the dhaniya pudina adrak garnish. Some people like a dollop of ghee over it, just like Khichri. The dish is utterly yummy, slurp it slowly, relishing the taste well. Some fresh greens and onion salad served on the side is awesome. You don't require anything else with it. Perfect recipe! Haleem turned out to be so delicious. Thanks a lot!